Built for Thomas Houghton, this two-storey brick building continues to be used as a retail store. In 1907, it was the premises of M. A. Vigor, millinery store. It has been covered with stucco, the cornice was removed and the shop front replaced. 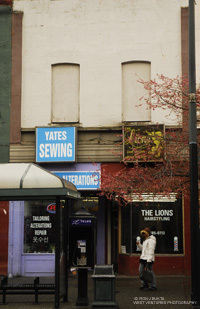 In 2009, it is the site of a sewing shop.